I recently read a book that was equal parts informative, interesting, terrifying and disgusting. 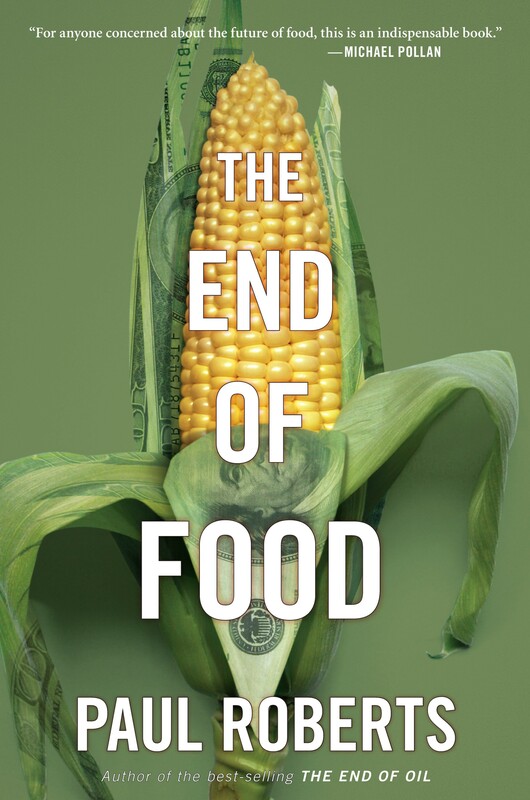 The book I’m talking about is Paul Roberts’ “The End of Food.” This book is not for the faint of heart and it will definitely make you rethink a lot of the things you see in the grocery store. The more I read, the less happy I am with our current state of food. Have you read the latest controversy on the “pink-slime“? We simply do not know what is in our food. We just don’t. We go to the grocery store and think we’re being healthy and mindful by buying a bunch of fresh vegetables but in reality, those veggies could be GMOs and we might not even realize it. I mean, do they put a sticker on that zucchini that says “GMO”? I don’t know. Sometimes it feels like we are trapped in a sci-fi horror movie. Here are just a few quotes and a few of my thoughts on the book. It’s really worth a read if you’re interested in knowing what you’re putting in your body. The book scared me, but it informed me too. I hope there is a better, healthier way to eat foods. Reading about the evolution of the human race was fascinating and I had a lot of “ah ha” moments. It made so much sense once I understood the connection of the brilliance of the body and the way our ancestors used to live. The body was designed for “scarcity”–for going long periods of time without food while the hunters and gatherers hunted the massive beasts. The body is built to hold onto fat and weight because back then, it literally depended on it. That has changed so much with our current lifestyle. We aren’t starving–food isn’t scarce at all. Hungry? Go to 7-11 and grab a candy bar. Food temptations are everywhere around us–fast food commercials, convenience foods, everything…there is no scarcity anymore and our bodies haven’t caught up to that. They still hold on to that fat that we AREN’T burning off for fuel as we hunt the massive beasts! The chapters about how food is manufactured and meat is processed would turn anyone against eating meat! I was a vegetarian for nearly 12 years and part of the reason was because of the animal cruelty issues surrounding it. Even though I eat meat now, I struggle with the moral part of it. It may not be an answer, but I try to just disconnect that “this used to be an animal.” It was hard to read about the chicken farms, but the information about the Avian Flu that began with some chicken farms were definitely enlightening. The chapter on the end of meals was incredibly sad to me. As a kid, my family ate every dinner together at the table–without any television watching. While as an angsty teen I hated it, I am grateful that my parents enforced that tradition. It’s a tradition I would like to continue with my kids. I think it’s important to unplug the electronics and enjoy each other’s company over a meal. But how many of us sit in front of the TV while we eat our dinners microwaved? That was me for a long time. It’s something I don’t want to teach my kids! Real food that does not come out of a box and good conversation over a table of healthy meals, that’s what I want. As a general rule, when I buy processed foods I try to look at the ingredients list and buy things with the fewest ingredients as possible. It’s a challenge, for sure, but I like to think I’m making a difference by buying something with ingredients I can pronounce. 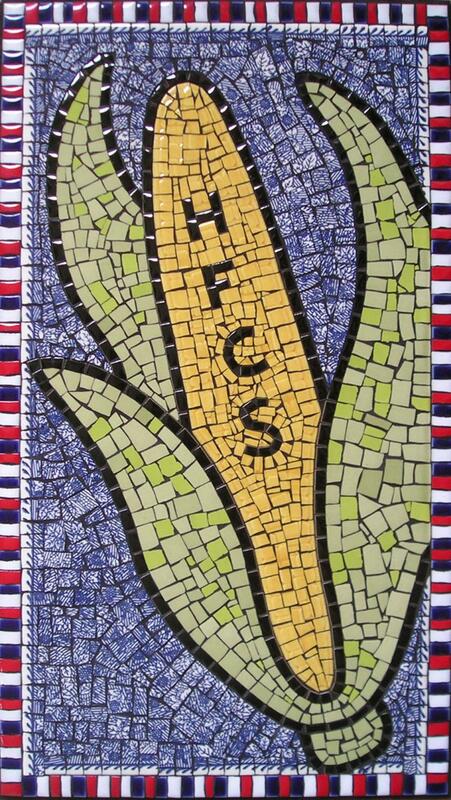 The chapter on sugar and HFCS was my favorite, obviously. I’ve struggled with sugar for years. It’s something that I wish I had more willpower to resist. It’s something I hate that I love. Have you ever looked at some of the labels in your pantry? You would be shocked at just how many items contain High Fructose Corn Syrup. It’s even in mouthwash! YUCK! The book was fascinating, frightening and disheartening. What I didn’t like about the book was that it didn’t provide any alternatives, or ideas on how to STOP the end of food. There was no light at the end of the tunnel in this book. QUESTION: Have you read this book? What were your thoughts? How do you feel about this topic? I added this one to my wishlist. Right now I need to read the stack of books on my nightstand, but I’ll definitely be picking this one up! 90% of the produce we eat comes from local farms and its all organic. Occasionally I buy sausage or bacon from them as well, but the meat is pricey as its also organic. It actually does taste better then the stuff we generally buy though! And there’s no wondering if its “real” food or not either. I’d love to hear your take on it when you read the book. I try to get farmer’s markets produce for most of the year. Winter time is harder here in Portland because most of the farmer’s markets shut down. When we get meat, we try to get it at Trader Joe’s. I have been reading a lot of nutrition books lately–Food Rules by Michael Pollan, Deep Nutrition by Cate Shanahan, Death by Supermarket by Nancy Deville….all of these books have the same thing in common! Eat food that is recognizable as food. I’m trying & will continue to try, but it constantly amazes me that it’s actually difficult to do in our culture right now! We have ‘science fiction’ food being forced onto us at every turn–gas stations, commercials, grocery stores. It sickens me that our country continues to become unhealthier every day and yet we are being pushed towards the very processed foods that are making us unhealthy. I wish the FDA was not ‘in bed’ with all of the manufacturers/processors of these fake foods and we could get back to all of us eating natural, whole foods. I haven’t read all of those books you named, I will add them to my list. They sound intriguing. The topic interests me and it also scares me, but knowledge is power right? I like your phrase “eat food that is recognizable as food.” That’s a good motto! I really enjoyed your blog post. Science and food is a huge part of my life. 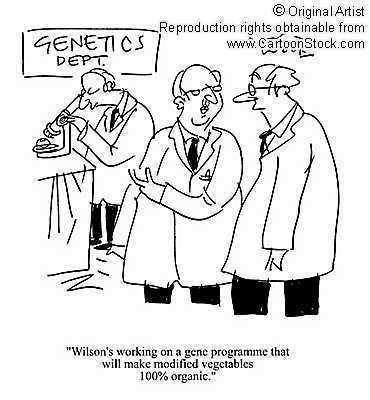 As a biotechnology student, I will soon be creating some of those GMOs that people hate so much. I have had many wrestlings with myself about this and have come to the conclusion that GMOs are a future for us but thorough testing is imperative. I additionally am an animal lover. I have 2 cats and volunteer weekly at a shelter. I read all the Michael Pollan books and I think the conclusion that he comes to is one I can live with as well. Eating meat does not have to be a bad thing. But if we choose to do so, we have an obligation to the animals we eat that they have as good a life as we can give them and that they die in a humane way. The worst offenders for animal treatment are egg-laying chickens and pork. If you have to eat those I would spring for farmer’s market products which are generally small farms using humane methods. We buy the $4 eggs from the store that are organic and cage-free. While those two words have many interpretations, I believe that it is better than the alternative. This book sounds interesting and right up my alley. I’ll have to check it out! I would love to hear more about your job as biotech person doing the GMO’s. To be honest, I just don’t know enough about the topic. The End of Food was the first real introduction I had to it. Eating meat is definitely not a bad thing–I was a vegetarian for over a decade–but knowing that the meat isn’t mysterious slime or from disreputable companies is important. Thanks for the tips on the chickens and pork. I didn’t know that. This sounds like an interesting book. I try to make a connection with most of my food, particularly meat. I try to think about where the meat came from and how it was treated. I think eating meat is okay, as long as the animal was treated well while it was alive and respectfully. That is why I also try very hard not to waste any meat at all and never throw any out. I also try really hard not to eat ‘corporate’ meat. Some places like Chipotle are trying to make a difference and I will support them, but I rarely eat land meat in a chain restaurant. I will eat seafood, though. There are just some problems inherent in trying to eat ethically like cost and availability. How do you do the research on how the meat was processed and how the animals were treated? That’s cool about Chipotle–I did not know that.